They say diamonds are a girl’s best friend, but a girl like me would have to say that there are far better things in life than diamonds. For me, this list includes oysters. Some of the most beautiful things in the world come from the sea, a whole different world full of colours and life and secrets that will never be revealed to us. Oysters, to me, are the secrets of the ocean contained. Each beautiful shell unique and carrying the smell, the taste and the stories of the sea. If you don’t know by now, oysters are one of my favourite things in the world. They are not only a favourite food, they are an astoundingly complex and interesting species to study. I could spend days discussing my love for oysters and all the good they bring to this world. If you’d like to hear more about that, for the love of oysters, click here! If you love eating these briny beauties as much as I do, you must know that going out to an oyster bar can start to get expensive. Shucking them yourself is lots of fun (if you know how) and a great money saver! I’ll seriously warn you though, please shuck carefully! You don’t want to hurt yourself! If you’re in Toronto (Ontario, Canada), I recommend contacting Oysterboy to do a shucking class! Lots to learn, and lots of fun! Shucking your own oysters has lots of benefits! 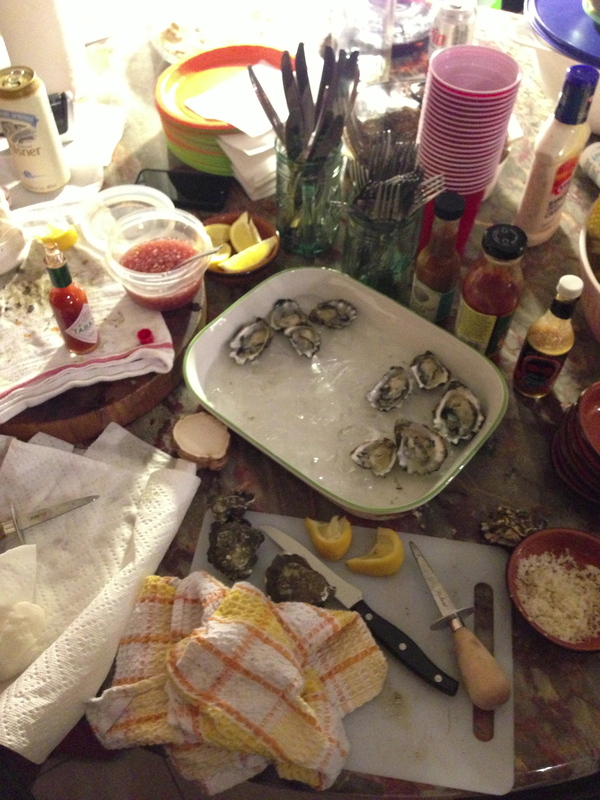 You save money, you can enjoy oysters in the comfort of your own home (or whatever environment you please) and you can impress friends and family at get togethers or family gatherings. Oysters are great for any occasion! There’s nothing better than a freshly shucked oyster eaten as is, but I do like to play around with different flavours so I always have my go-to sauces and oyster-sidekicks available. Most restaurants will serve up raw oysters with a mignonette, which is a classic condiment for raw oysters on the half shell. The basic ingredients for a mignonette are typically vinegar and shallots. However, there are tons of different recipes, using different vinegars, seasonings and herbs. I love the punch of flavour a mignonette adds to briny oysters. It’s the perfect complement! *You can use red wine vinegar or white wine vinegar. I prefer red wine vinegar, but I often mix half red and half white. 1. Combine all the ingredients in a small bowl and chill. 2. Serve with freshly shucked raw oysters or clams on the half shell. Oysters are a huge hit amongst my friends and family and I hope this post inspires you to start shucking your own oysters at home. Oysters are delicious and full of protein and nutrients and are a great way to bring people together! 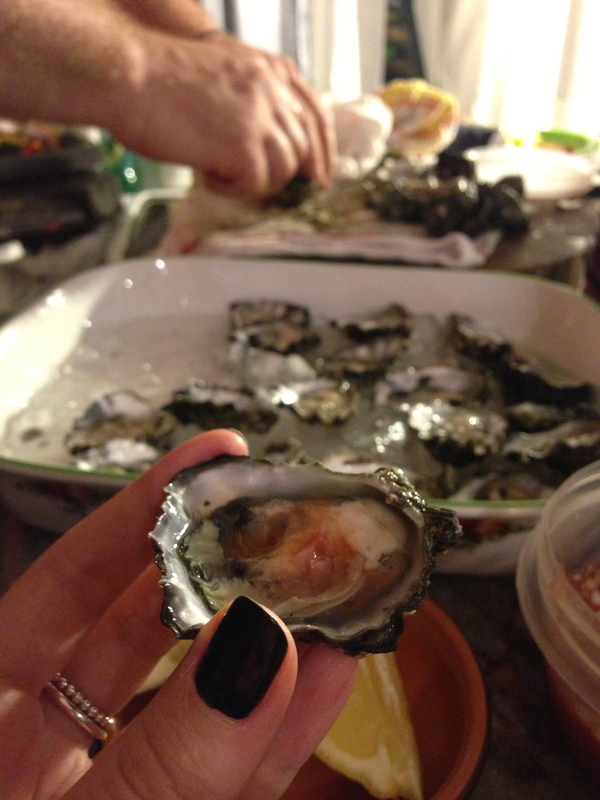 If you haven’t ever tried a raw (or cooked) oyster, now is definitely the time to take the leap! Read some of my other oyster posts. I aim to spread the love and joy of oysters, one read at a time! Looks awesome. Oysters are really something special here, and nearly impossible to find. Im jeally. Thanks Francesca! That’s so sad to hear!!! I should ship you a box…somehow. I don’t know how I’d survive…they’re one of my main food sources, lol. Those are unique looking oysters. What type are they? Thanks for checking out the post Jody! They are unique! They’re Kumamotos. A smaller oyster with a deep cup (like a little bucket). The flavour is sweet and rich with a cucumber-y taste to them. I’ve also heard them be referred to as dessert oysters. They’re definitely one of my favourites! (Although I love all oysters.) I know a bunch of people who love these ones specifically. Where do you live? I know oyster species vary in different parts, maybe you can get your hands on some! There are a couple other types of oysters I’ve tried that are similar to Kumamotos too.